I really enjoyed staying at Brisons Veor and found it to be an immensely inspiring environment. 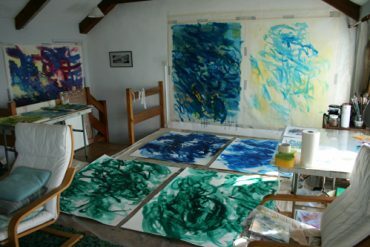 I made several works on paper and a series of drawings initially and then began working on large paintings on pre-primed canvas. These paintings I very quickly began to see as the beginning of a new series of paintings which I intend to finish in my studio in London. I also made a series of large (5ftx4ft) works on paper, acrylic on heavy weight watercolour paper. 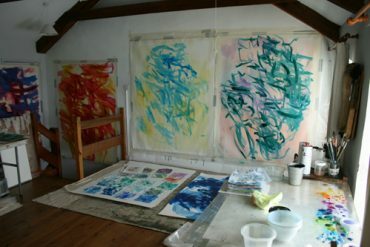 These were a very significant part of the residency for me seeming to come directly from my experience of the sea and the watery environment at Brison’s and Cape Cornwall. I found the experience of being so close to the sea at all times extremely immersive, contemplative and powerful which certainly impacted on the work I made during the residency. Overall I was very pleased with the work I made at Brisons. Returning to London after such an immersive experience in Cape Cornwall has been quite difficult and it has taken me some time to settle back into a routine in the studio. Yet now I realize the residency has caused a positive shift in my practice which is currently very exciting, without the residency it is possible that I would not have allowed this new period of experimentation to happen.